Carl's Jr.'s CBD-infused Rocky Mountain High: CheeseBurger Delight. Carl's Jr. is making history this 4/20. 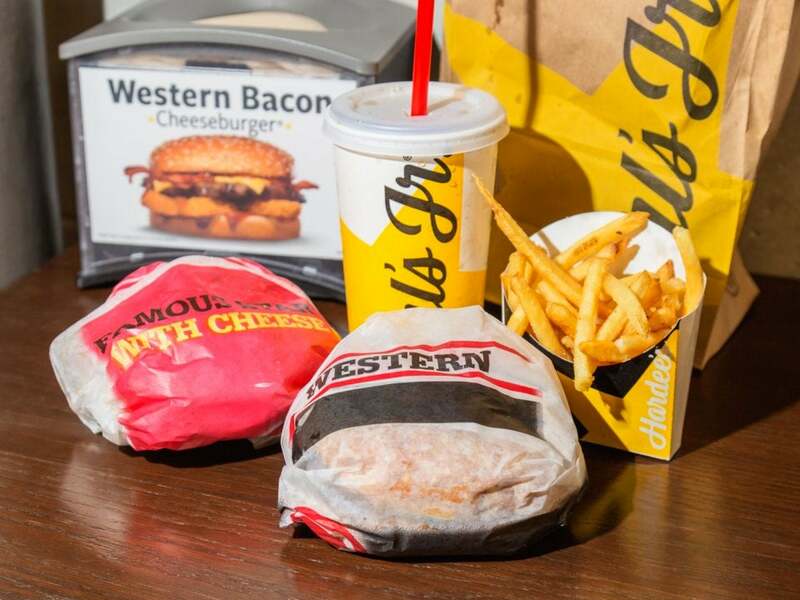 On Saturday, Carl's Jr. will debut the CBD-infused "Rocky Mountain High: CheeseBurger Delight" at a single location in Denver. The CBD burger will be available for $4.20 during the one-day test, fittingly held on April 20, a weed-filled celebration for many Americans. With the test, Carl's Jr. would become the first major fast-food chain to roll out a cannabis-infused menu item -- even if just for a one-location, one-day event. The CheeseBurger Delight consists of two beef patties, topped with pickled jalapenos, pepper jack cheese, fries, and CBD-infused "Santa Fe Sauce." Carl's Jr. has been working on the CBD burger since its vegan Beyond Meat burger launch in early January, according to Patty Trevino, Carl's Jr.'s senior vice president of brand marketing. Unlike with most menu tests, one of Trevino's earliest conversations about Carl's Jr.'s decision to make a CBD-infused burger was with the company's legal team. The Denver restaurant was picked as the 4/20 test spot in part because Colorado legalized recreational marijuana in 2014. Trevino said the test is more than a one-day 4/20 stunt. Carl's Jr. will be monitoring sales and customer and franchisee responses, and if all goes well, Trevino said, expanding the test remains an option -- with the possibility of one day rolling out a CBD-infused burger across the U.S.
"If anyone is going to do it, I would want Carl's Jr. to do it," Trevino said of the prospect of launching a CBD-infused menu item nationally. While navigating state-by-state regulations could prove challenging, Trevino said Carl's Jr. had an advantage as a West Coast chain, operating in more states that have fully legalized marijuana. In total, Carl's Jr. and Hardee's, its sister brand that dominates the South and Midwest, have 3,800 locations in 44 states and internationally. CBD, which has been celebrated for its potential health benefits, is the nonpsychoactive component of marijuana -- meaning that eating a CBD burger will not get you high. With the passage of last year's farm bill, CBD is becoming mainstream, despite reports of dangerous ingredients and misleading labels. Retailers and restaurants are increasingly intrigued by CBD -- Walgreens and CVS have signed deals to sell CBD topicals, and the trendy restaurant chain By Chloe serves up CBD-infused sweets, for example. A team of analysts at the investment bank Cowen recently estimated that the US market for CBD could skyrocket to $16 billion by 2025 from roughly $1 billion to $2 billion now. Carl's Jr. is sourcing its hemp-derived CBD oil from BlueBird Botanicals, a Colorado company. Trevino said that a few years ago, it didn't seem as if CBD and legal weed would ever be something national restaurants could explore. "If you were to ask me when I was at Burger King back in the mid-2000s, I would have been like, no way," Trevino said. "But today, this is a huge trend with consumers." The "Rocky Mountain High: CheeseBurger Delight" will be sold at the Carl's Jr. at 4050 Colorado Blvd. in Denver starting at 6 a.m. on Saturday, while supplies last. 7 Fast-Food Franchises Had More Sales Than Chick-fil-A Last Year. Can You Name Them?